Game Theory Who didn’t play at least one Games Workshop game growing up? 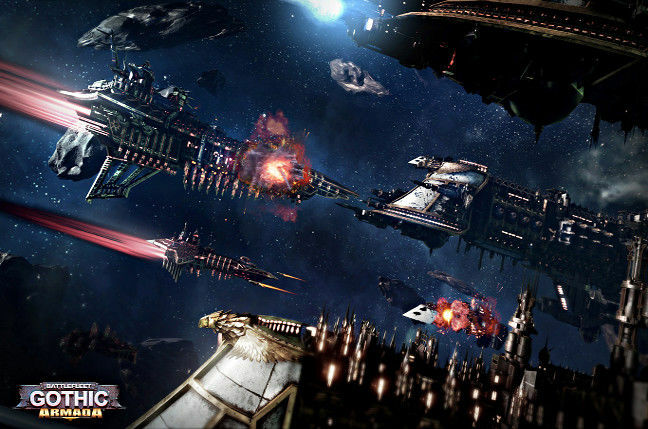 I remember still being in my early twenties and having a full blown Space Marine versus Eldar battle playing out across the kitchen floor of my small apartment, above a cheese shop in Toronto. Games Workshop is the only table top gaming “collectables” company that holds corporation status. Like any Evilcorp, there have been rumours that they may have even changed the rules to benefit selling products rather than refine and improve the gameplay. Around 10 per cent of GW's profits come from royalties and with the rash of new titles in development, this is bound to rise. The Warhammer world is inhabited by familiar personalities. There’s an infinite assortment of Tolkienesque creatures, xenomorphs straight out of a Ridley Scott film and more recently the Warhammer 40k Tau army, which looks like a very close relative of Appleseed. My personal favourites have always been the Skaven rat-men, hissing and mutated from Warpstone magic. I never miss a chance to trolley out the Screaming Bell and the Plague Monks! So it’s with my Bolt Thrower t-shirt firmly in place that I welcome the latest digital incarnation of these rodents in Mordheim City of the Damned, which is currently in early access on Steam from developers Rogue Factor and priced at £23.99. The map I played during early access is hard to navigate at first and looks much like a dark, horrid medieval port city, awash with brutality and putrid creatures. 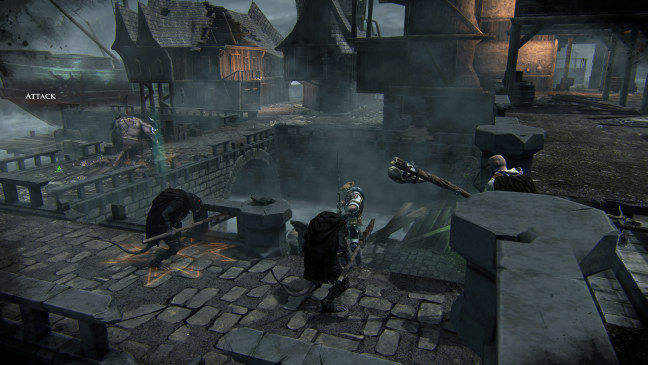 The gameplay is initiative driven and turn-based, with whichever character has the most initiative taking their turn first. For example, Skaven, who have high initiative, often move first – but on the flip side, the other player, with human characters, gets to react to these moves. This can sometimes be beneficial... unless I’m already dead. This gameplay mechanic allows the action to be constant and fast flowing. Like Blood Bowl 2, I get a limited time to make my moves. I can attack or set my troops' stance to ambush, dodge or parry. There are there are three broad categories of troop types: magic users; melee; or ranged. As with Blood Bowl, I can level up my Warband but they can die and get injured during combat. So far, I have only had access to four warbands, a bunch of Nuns who are underwhelming, Skaven, Humans and The Chaos Warband Possessed. I’m sceptical it will be delivered as planned this month, as last week’s update didn’t happen. Graphically adequate with some amusing animations, this game obviously still needs a lot of work to refine and modernise its aesthetics. My Overclockers rig won’t be steaming any time soon to churn out these NURBS. Just like the tabletop game Necromunda, I can imagine gameplay will be engaging with a group of friends playing in a league. 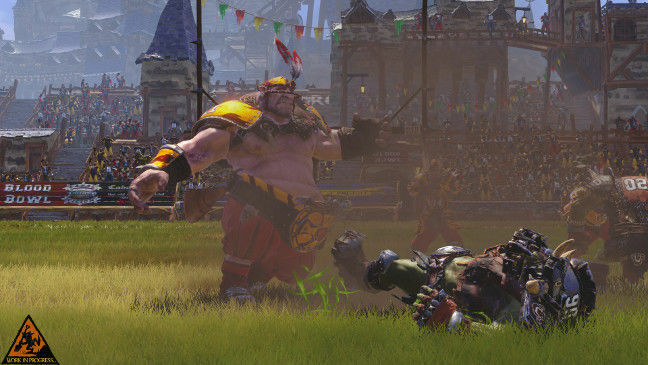 While I wait for the Skavens of Mordheim to get the Doomwheel running at a sufficient speed to impress my GPUs, I’m off to watch Game of Gnomes with the release of Blood Bowl 2 from developers Cyanide on Steam for £35 (also available for PS4 and Xbox One). 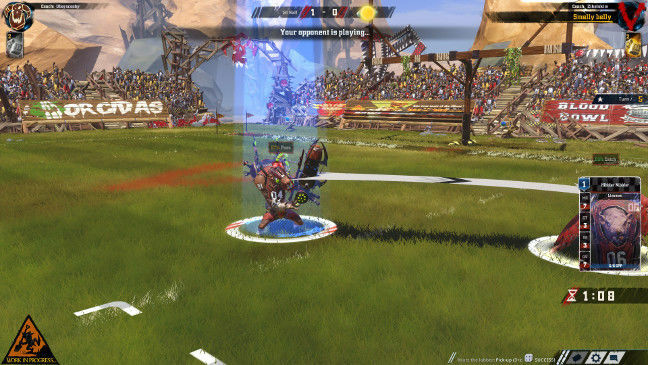 This new release is a polished smooth update of Blood Bowl, the 2009 digital adaptation of the turnsbased board game Fantasy Football. 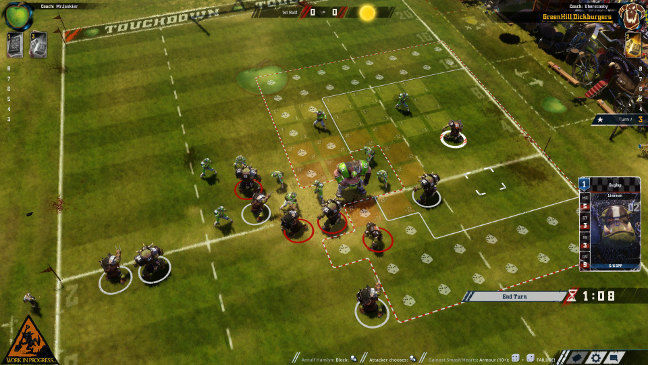 As much as I loved playing FUMBBL before 2009 (the online JAVA Blood Bowl league) it warmed the cockles of my Warpstone heart to see this game going mainstream. Let the blood-letting begin! Blood Bowl 2 has magnificent cut-scene animations that have brought the original characters to life. The attention to detail in the swirly wagging rat ogre tails and hordes of mutants in the bleachers makes this game strangely hypnotising and immersive. Cut-scenes happen when I make a successful block, but maybe an option for cutscenes only on injury would have been a better idea to save time. One issue that I haven’t come across due to my Impressive BenQ BL2711U widescreen monitor, but that has caused more than more player to rage-quit on me, is the fact that the end turn button has been placed on the pitch, and can accidentally be pressed too soon in the heat of a game. Everything I do outside of my basic movement is on a roll of a die, so I can get runs of bad luck – and, seemingly less often, good fortune too. It’s important to trade players before they get too old (I know how they feel) or to avoid lowering my team value with unneeded skills. Reg rating? Four out of five.